On December 14, 2018, students, faculty and staff were notified via email that President Patrick F. Leahy would resign effective July 31, 2019. Leahy informed the Board Of Trustees of this decision prior to the announcement to the Wilkes campus. Leahy has accepted the opportunity to become the 10th President of Monmouth University in West Long Branch, NJ. Monmouth University is located on the northern coast of New Jersey that has a similar upbringing to Wilkes University both in 1933; first starting as a junior college, then to college, then to a university. The university houses 21 Division-I athletic teams, 32 undergraduate and 24 graduate programs. “As we move forward, we’ll build upon the strong foundation here at Monmouth and move toward even higher levels of excellence and access. It is clear that the Monmouth community is a family. I, along with my wife, Amy, and our children, are excited to be joining this family at the Jersey Shore,” said Leahy in a press release from Monmouth University. Leahy released his own statement on Dec 21 to tell the campus himself about his decision to move on from Wilkes. 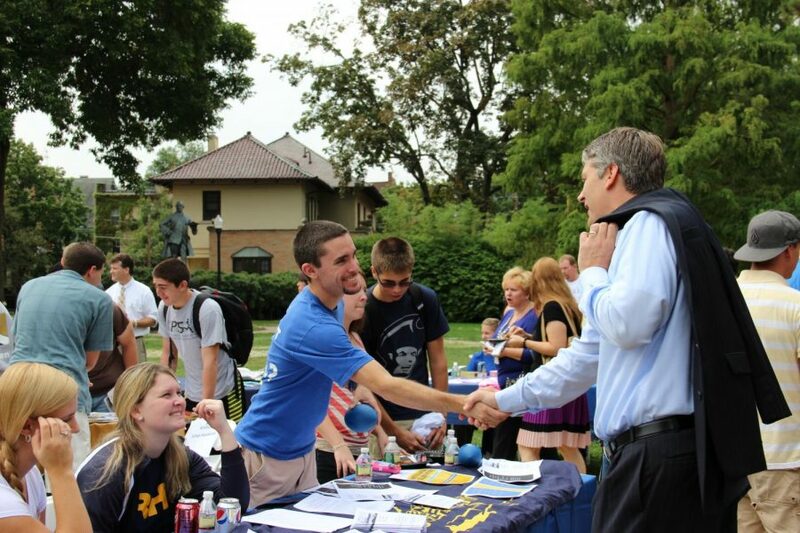 He announced a few opportunities for students to interact with him on campus before he leaves. 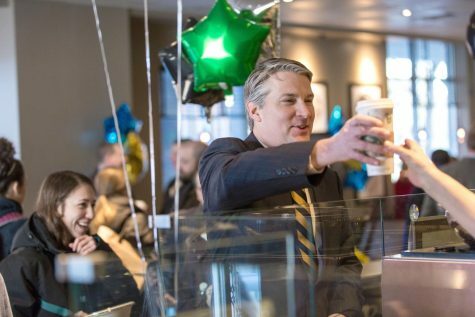 Over his seven-year tenure at the university, Leahy has brought a newer life to the campus and the community. Leahy and his peers are adamant about his student-focused outlook as he has put forth initiatives like the Founder’s Gala to help raise money for the First Generation Scholarship Fund for students on campus. Another accomplishment of Leahy was his establishment of a partnership with Panama where the university welcomes students from IFARHU, MEDUCA, students who attend Universidad Technológica de Panamá, and Panamanian diplomats under the Ministerio de Relaciones Exteriores program. 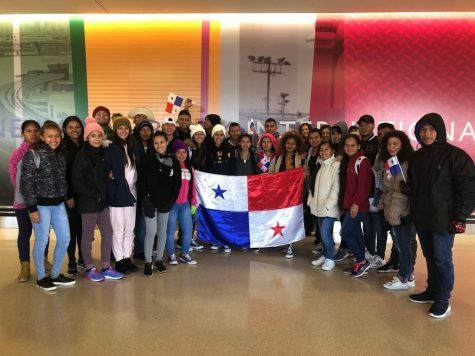 Juan Astegiano, a Student Aid at the Office of International Engagement, works closely with different groups of Panamanian students at the University. He commented on how Leahy has also reached out to help those students in particular. “We always felt that Dr. Leahy’s support and willingness to help and increase the international community,” added Astegiano. President Leahy has campaigned to make the campus more diverse bringing in international students from all over the world including countries like Saudi Arabia, Kuwait, China, among others. 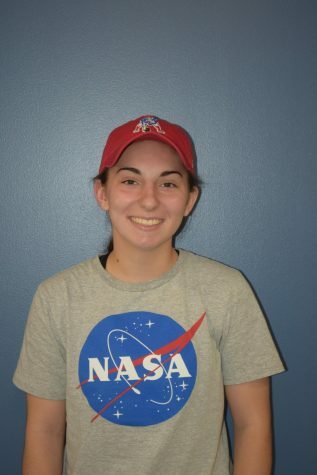 Astegiano is also an international student studying history, international studies and political science from Buenos Aires, Argentina. “As an international student, Dr. Leahy always made us feel welcome, and a very special part of the Wilkes community,” said Astegiano. “I believe that Dr. Leahy leaving Wilkes is going to be a big loss for the entire university as well as the community of Wilkes-Barre as a whole,” added Astegiano. Leahy’s biggest initiative for the campus was his “Gateway to the Future” plan. The plan kickstarted in 2014 and is expected to end in 2020. 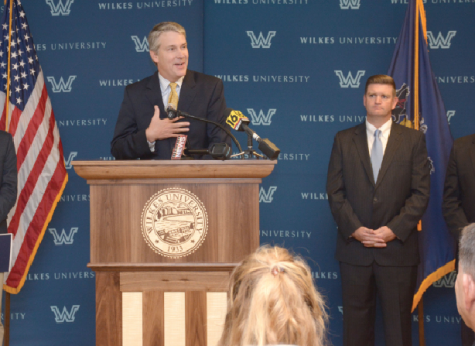 This plan was initiated to strengthen the university’ academics and infrastructure, to support the local Wilkes-Barre community, and to attract, recruit and retain graduates and undergraduates. Through this plan, Leahy and the strategic planning committee, have opened the Karembelas Media and Communication Center, reconstructed the Fenner Quadrangle, the Mark Engineering Center inside of the Stark Learning Center, and other enhancement projects. Most recently, Wilkes University was designated as a doctoral university in the 2018 Carnegie Classification of Institutions of Higher Education. Wilkes is one of 14 private universities in Pennsylvania with this accreditation. Michele Foust, associate director of international engagement, commented on Leahy’s push to make the campus more welcoming to prospective and current students, faculty, and staff. Foust also commented on Leahy’s character and his accomplishments for students. “I think he was a very great president, he brought a lot of funding not just for students, but for faculty and staff. “I am hoping the President we get has the same youthful, go-getting attitude,” added Foust. Dr. Anne Skleder, the senior vice president/provost also commented on Leahy’s resignation as someone who worked very closely with him since her 2014 start at the university. She also spoke on how Leahy has impacted the campus and the Wilkes-Barre community through his seven-year tenure. Skleder talked about how it is a great opportunity for Leahy as Monmouth is a perfect match for him because of its similarity to Wilkes. Skleder said the university is in a better position to lose a president than we were before Leahy. Although Skleder wasn’t at the university for Leahy’s first two years at Wilkes University, she commended all of his work to improve the campus like the removal of buildings that needed to be moved, the signage of the campus, along other major accomplishments. She also commented on how his family have become apart of this campus either by attending different athletic events or just being present in campus itself. She said this has made a personal impact on students and staff she’s talked to on the campus. She also talked about how she hopes to find a person to be transparent and open, savvy, who puts students first, and to follow our university’s vision. The Board of Trustees has the responsibility of naming the next president and have wasted no time to start that process after receiving Leahy’s resignation. They will also assign a search committee to aid them, as stated in the university’s faculty handbook. There is no word on when this process will take place and whether or not they will have an interim president or just hire directly.